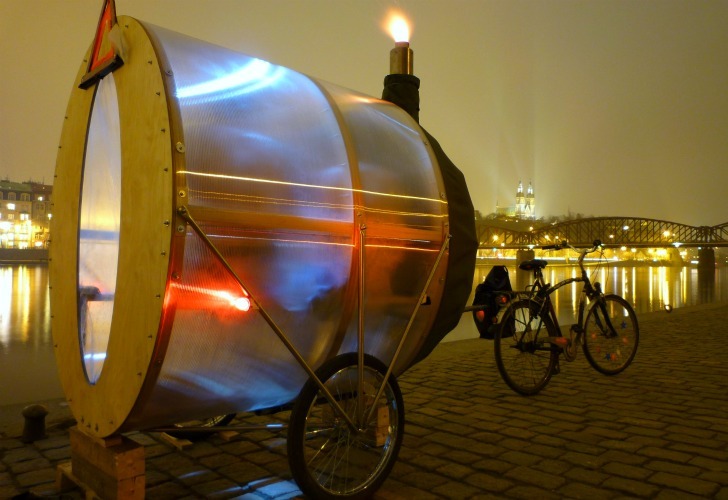 For relaxation on the move, try this bike-transported sauna designed by Prague-based H3T Architects. Built from lightweight materials, the wood-fired sauna can accommodate up to six people and can easily be towed behind a bike to any location. 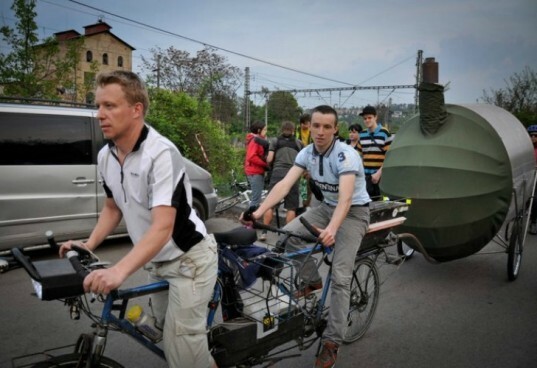 So far the sauna has been featured in a parade and various bike events around Prague. H3T Architects have designed a number of unique saunas including the ‘Flying Sauna’ that hangs below a bridge and accessed via the river underneath. Their latest sauna is a portable version made from light and durable materials with a translucent cover to let in natural daylight. A wood-fired stove situated at the front of the sauna provides the heat and expels its smoke through a tiny protruding chimney. The wooden benches inside are compact, functional and amazingly long enough to accomodate 6 people — although 4 would be more comfortable. An elastic membrane on the end keeps the heat in and provides access in and out of the sauna. Completed, early in 2011, Bicycle Sauna Kolonik is dedicated to the cyclists of Prague “who have to prove constantly that they are spirited enough to adopt this non-standard way of transportation around the city.” The idea was to have a mobile sauna that was lightweight enough to tow by bike and take to the river or lake to socialize with friends and relax. The Kolonik is a new and unconventional social tool that interacts with its immediate site. If you’re in Prague, you can check it out in person at Bajkazyl, a community bike shop. H3T Architects have designed a number of unique saunas including the 'Flying Sauna' that hangs below a bridge and accessed via the river underneath. Bicycle Sauna Kolonik on display for Prague cyclists. Their latest sauna is a portable version made from light and durable materials with a translucent cover to let in natural daylight. A wood fired stove situated at the front of the sauna provides the heat and expels its smoke through a tiny protruding chimney. The sauna can be towed by a tandem bike or a regular one-seater. Graphic instructions let you know more about the sauna. Wooden benches inside are compact, functional and amazingly long enough for 6 people. An elastic membrane on the end keeps the heat in and provides access in and out of the sauna. Completed, early in 2011, Bicycle Sauna Kolonik is dedicated to the cyclists of Prague "who have to prove constantly that they are spirited enough to adopt this non-standard way of transportation around the city." The idea was to have a mobile sauna that was lightweight enough to tow by bike and take to the river or lake to socialize with friends and relax. The mobile sauna is a new and unconventional social tool that interacts with its immediate site. If you're in Prague, you can check it out in person at Bajkazyl, a community bike shop.